at the NZ International Comedy Festival at Q Theatre Vault. Addicted to Darcy? Lost all Sense and Sensibility? Bonkers for Big Balls? 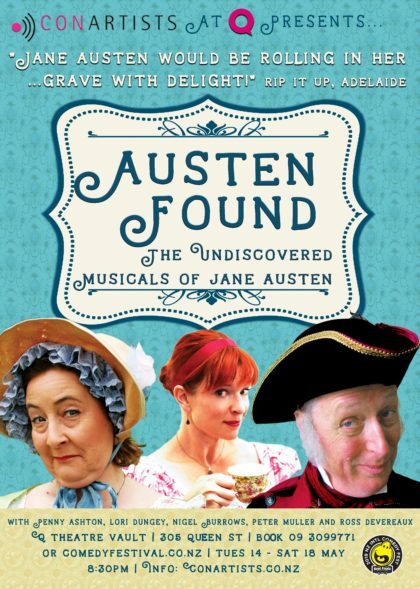 Well put down your cross-stitching and join one of NZ’s most experienced improv troupe, ConArtists, as they swoon, romp, and pianoforte their way through an entirely improvised Austenian Musical. Charming suitors, meddlesome mothers, tight breeches and surprisingly well-educated girls will all paint a vivid picture in song, dance and passionate hand-holding. It’s been ten years since they first sold out the NZ International Comedy Festival and Adelaide Fringe Festival, so they’re dusting off their bonnets and they’re back. Bookings here through Comedy Fest.